Myth #1: Because you have to pay a deductible when filing a claim, insurance is pointless. Fact: You’ll still probably come out way ahead with insurance. People with smartphone insurance are sometimes surprised to find that they have to pay a deductible when filing a claim. But think about the cost of a new smartphone without insurance: The average cost of a non-contract smartphone—that is, one that doesn’t come for some remarkably low price when you sign a multi-year contract—is $545. The average deductible is quite a bit lower, even when you factor in the monthly insurance fees. Myth #2: The best insurance for your smart phone is a good case. Fact: For some situations. Investing in a protective phone case is a smart call, since it’s all that comes between your smartphone and an unforgiving sidewalk. But a phone case doesn’t prevent your smartphone from getting lost, stolen, or suffering irreparable water damage. Approximately 80 million phones are lost, stolen, or damaged each year, at a rate of 2.5 phones every second. 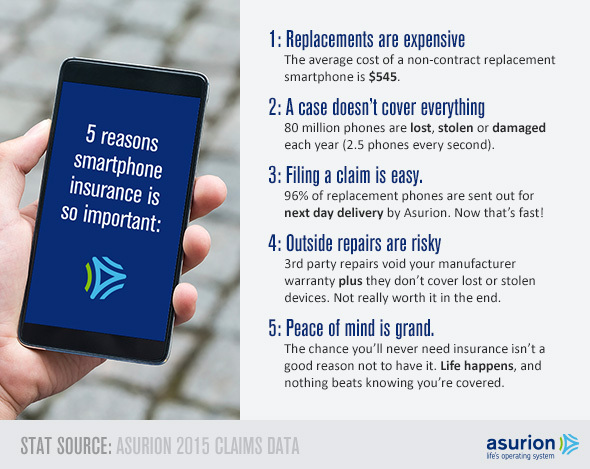 Enter Asurion, which covers it all—loss, theft, accidental damage, and malfunction. Myth #3: Filing an insurance claim is a pain in the neck. Expect to be on hold for hours. Fact: You can make a claim with Asurion 24 hours a day, seven days a week, online or over the phone. And Asurion sends 96 percent of its replacement phones out for next business day delivery. That sure beats making an appointment at your neighborhood cell phone carrier for the privilege of paying full price for a replacement. Myth #4: You can always get your phone fixed if it breaks. Fact: It depends. If your phone can be repaired, you do have some options. But device repairs often void whatever warranty you might have on your smartphone, so if anything else happens to it, the manufacturer is off the hook and you’re stuck with a bill. And still, if the device is lost, stolen or waterlogged, you’re completely out of luck if you didn’t opt for device protection. Myth #5: Insurance just isn’t a good value since you probably won’t ever need it. Fact: You’re taking a risk without it. It’s true, you may never lose your phone. You may never drop your phone in the toilet or launch it off the roof of a thirteen-story building. Similarly, you may also never get into a car accident, but you still need car insurance. Asurion offers the protection you need, plus comes with a host of valuable features like virus protection, phone location apps, and tech support. Unfortunately, insurance can usually be added only within days of activating a new phone. If you aren’t replacing your device now, you still might want to check with your wireless carrier to see if you can add it, or if there is an open enrollment period coming up. Don’t take your chances, get mobile protection. Ask your carrier for more information, or visit Asurion.com. We are here 24/7. File your claim online any time, day or night. ©Asurion 1992-2019. All Rights Reserved.